As someone who has struggled with acne for pretty much my entire life, I've definitely been through my fair share of skincare products. Since I was around 11 years old I've been battling spots, blackheads, blemishes and scarring and have been through more skincare treatments than I can remember. I'm planning to write a full blog post on my skincare journey soon, but for today, I thought I would share with you guys some of the products that have made the most difference with my skin. 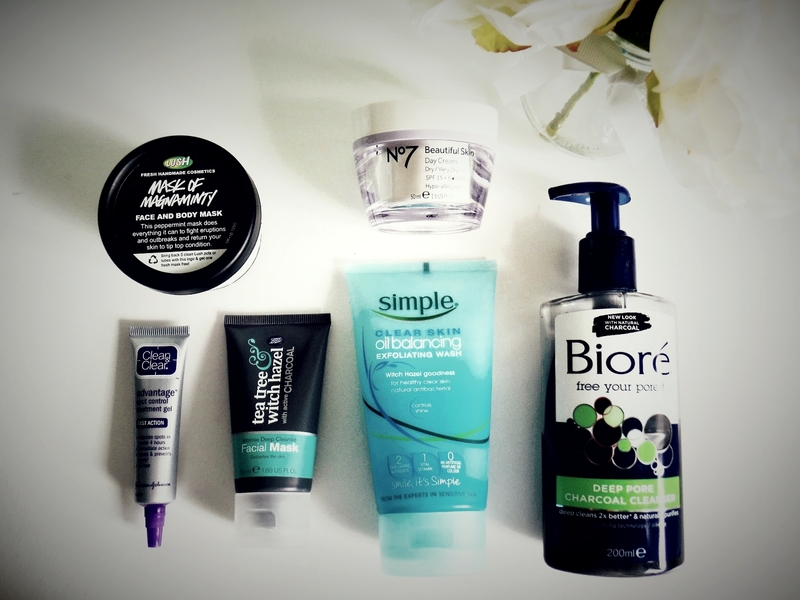 Whilst none of these products have cleared my acne, they all help to reduce spots, clean my skin, and promote healthy skincare in their own way. Although bear in mind that what works for me may not necessarily work for you, as everybody's skin is different! I picked this up purely for the fact that it's promoted as 'oil balancing', as I'm someone has extreme combination skin. I've been using it for quite a while now and whilst it's nothing groundbreaking, I have noticed a reduction of oil in my t-zone. It's also a gentle exfoliator which helps with the dryness on my cheeks. Charcoal is an ingredient known for its' cleansing ability, and works at pulling all of the dirt and oil out of your pores. As I'm someone with sensitive areas of skin, the first time I used this was quite intense and definitely stung a little bit. I persevered and now I really enjoy using this product! It really feels like it's doing a good job of cleaning my skin and I definitely noticed a reduction in those small surface spots. The stinging only occurred the first time I used this, although if you have very sensitive skin I'd probably advise staying away from this product. This is a face mask designed specifically for calming down spots and it's one of my favourite masks to use. It's an incredibly cool, refreshing, clean feeling mask and is perfect for soothing those angry red spots. After a bit of online skincare research I discovered that tea tree is apparently an ingredient that works wonders on problem skin. I decided to pick up a face mask as I had my every day skincare routine pretty much sorted, and I ended up loving it. I've no idea if it's the tea tree, witch hazel, charcoal, or all three, but this mask is so lovely on the skin and it feels so lovely and clean every time I use it. Whilst I had some pretty good facial products, I knew that I also needed something that targeted my spots directly, so I did a bit of research and eventually decided on this product. If I apply this to a spot that broken, it stings like hell, but for some reason I quite like that because I feel like it's really working and getting deep down into the pores. I've noticed a reduction in the size and redness of my spots after applying this and usually within a few days of continuous applying the spot has disappeared. I'm now using this religiously! Whilst I struggle with oily skin and keeping my pores clean, I also struggle with severe dry patches on my cheeks and so I use a few different products on different areas of my skin. I would never apply this to my entire face as that would clog my pores way too much, but for those dry patches this works wonders. It keeps moisture locked into my skin all day and those flaky dry patches at bay. What skincare products are you currently using? Totally want to try that Lush mask!